How will you get to Sundance Lodge? 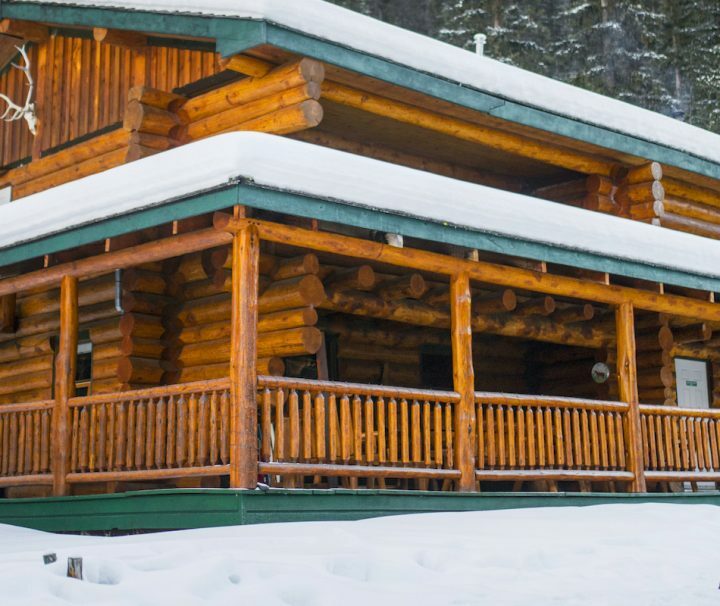 Banff’s closest backcountry lodge is accessed by three unique ways in winter and the best part is all can be done with no previous experience! Our guests love the accessibility of the track-set trail leading to Sundance Lodge almost as much as the baked goods and hot drinks that welcome them upon arrival. In this article we’ll give you the advice you need to know on routes to the lodge, three different winter methods of transporting yourself there, and a great backcountry map app to track progress via your smartphone. Before you decide on your method of transportation, you should also think about which route(s) you’ll take as there are a couple to choose from. A 11-kilometre trail from Healy Creek begins the journey via a new bridge over the wintery waterway that comes from Sunshine Village. 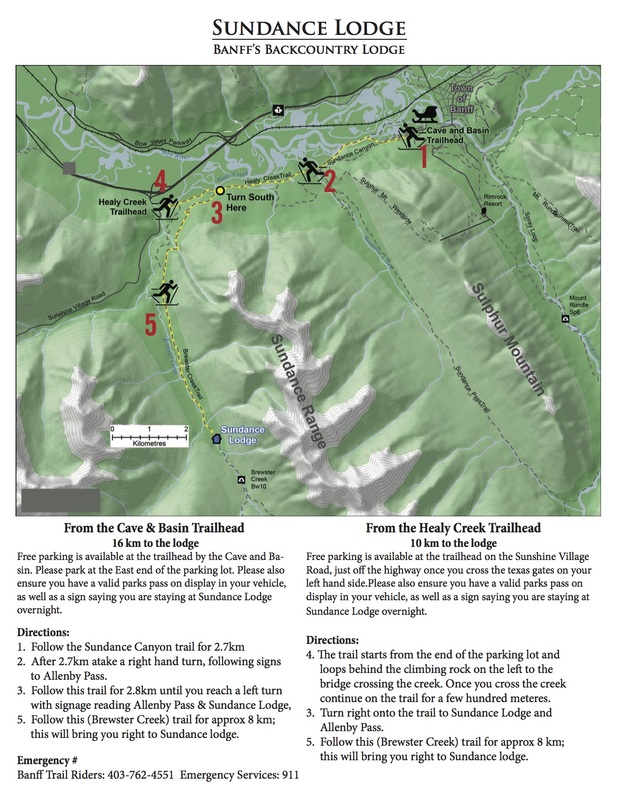 To get to this trailhead, you’ll need to drive from Banff to the Sunshine Village access road, about 10 minutes from town. The other route is accessed from the Cave & Basin National Historic Site. This 16-kilometre journey goes along the Sundance Canyon Trail which starts from the Cave & Basin – enjoy an extra 5 kilometres along the scenic Bow River. A third option you could do if your group has two vehicles is leaving a car at the Cave & Basin and starting the journey at Healy Creek then finishing at the Cave & Basin on your way out. Now for the three unique ways to get yourself to our off-the-grid backcountry retreat. Cross-country skis, snowshoeing, and fat biking will get you to Sundance Lodge in the winter and each offer their own excitement. All of these equipment types can be rented from Snowtips-Backtrax in downtown Banff. Although the trail is a gradual up-hill most of the way in, it is a welcomed downhill on the way out if you’re on skis or fat bike. Are you a skier but never cross-country skied, or are you a beginner at both? Either way, this is an easy option for any skill level and our guides track-set the trail for you to keep your skis in line. Meaning, a machine goes along the trail carving two grooves in the snow for cross-country skis that help to guide skis and ease the sliding process. When picking up your skis, ask the rental shop for a couple quick tips on gliding your skis and check out this YouTube video on how to cross-country ski. Pro tip: if the snow conditions are wet and sticky, make sure you get the rental shop to spray the bottoms of your skis with their Jig-a-Loo juice. Winter hiking in Banff can otherwise be described as snowshoeing. The best winter hikes in Banff are accessed with this centuries-old form of transportation and is yet another way to access Sundance Lodge. With no experience necessary, snowshoeing is an easy and thoughtless way to get to Sundance Lodge that makes the experience more about the journey and leaves time for conversation with those you’re travelling with. The newest trend in winter sports and not one that you would have found a hundred years ago (unlike skis and snowshoes) is fat biking. Sundance Lodge is the only backcountry lodge in Banff National Park that can be accessed via fat bike. Low pressure, large surface area tires allow for the bikes to ride through winter landscapes effortlessly. Conditions dependent, you’ll want to take advantage of this method with a heavy snowpack. Anyone who is proficient at mountain biking can get on a fat bike and ride through the transformed forest that would otherwise be a summertime playground. Fat biking from Sundance Lodge downhill can feel like a controlled roller coaster with deep snowpack surrounding the trails seemingly acting as cushions. If you are questioning whether this is the right way for you to get to the lodge, it might be best to take one out for a spin first before committing to the whole journey on a fat bike. Banff’s closest backcountry lodge is also Banff’s most diverse in ways to get there in winter. Your one-stop-shop for all equipment rental, heat packs, snacks, and some light gear is Snowtips-Backtrax on Bear Street in Banff. Another pro tip for tracking your progress is the Topo Canada Maps App (iOS) that has all backcountry trails in it and tracks you via GPS. Make sure you download the maps to Sundance Lodge for offline use.